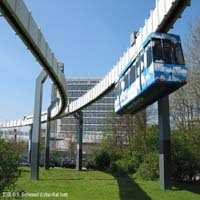 Sky Train in germany is a driverless passenger monorail system , developed by SIEMENS . This is fully automated and centrally controlled . In 1973, Germany made 22 million fund investment for the research and promotion of this system. A test line was opened on July 1975 in Dusseldorf , the capital city of the German state of North Rhine-Westphalia , with a length of 180 metres . In 1976, the system was extended by 1.5 km. In 1984 , it was implemented at the University of Dortmund to connect it north and south campuses . In 1993 , it went for fully public use . In a cabin 16 - 29 passengers can travel .